Why Do I Need to Edit My LinkedIn Profile? Are you wondering why your LinkedIn profile is not getting as many views as you think it should or looking for LinkedIn profile makeover services? It could be that you need a LinkedIn makeover. Our LinkedIn profile service provides clients with a LinkedIn profile makeover or with LinkedIn Profile retooling to properly highlight their skills so that they are more appealing to employers. We can do this for you too when you come to resume writing service. The headline you write is the first thing that employers looking for candidates with your skillset see on your profile. A boring headline doesn’t get much notice and so they move on. Why do I need to edit my LinkedIn profile? I hear you say. When you realize that according to a survey reported in Adweek some 87% of employers and recruiters use LinkedIn as part of their recruiting process you will know just how important it is. Having an up to date and effective profile is a vital part of your job hunting strategy and without it, you could be doomed to constant failure. Far too often LinkedIn users will set up their account and then simply leave it that way, often for years. They fail to keep it up to date or even to think about what is effective on their profile and what really needs to be changed. Having an effective LinkedIn profile makeover can help you to ensure that you get that interview with your next application or even get you found by a headhunter. Be prepared to put in the work: putting together an effective profile that is going to get you noticed is not easy so you will need to spend time and a lot of thought to get it right. Update your URL: this is the internet address of your profile page. LinkedIn allows you to customize this so that instead of a string of random numbers you can have your name and a description for instance. Review your photograph: you want to ensure that your photograph provides a professional image. A pouting holiday selfie does not do that. Have a photo with a plain background with you looking forward, or even to the left towards your information. Update your headline: this should not simply be your current job title: make it attention-grabbing and information about you to get any viewers attention. Sell yourself in your summary: make it personal and tell the reader what your passions are and what you have achieved over the last few years. Quantify those achievements: if you increased sales by 25% or reduced costs by 15% then shout this from the rooftop so that they all know. Use keywords that are relevant to your profession: often recruiters will search profiles using these words so look at other profiles in your area to identify commonly used words that you should use within your profile. If you are currently unemployed still include a current position: many recruiters will search in this area and if you have nothing you will not be found. Use the job title you want to gain and list what you are looking for. Don’t use clichés or overused “buzzwords”: just what is a “High achieving and driven manager”? Make sure your language is precise and unique. Don’t just list your responsibilities under your work history: recruiters and others will know what the responsibilities were simply from the job title. Sell yourself by listing your achievements. They want to know what value you can add to their business. Don’t have different information or dates on your profile to what you have in your resume: this will ring alarm bells for any recruiter who will want to know which is true and how much else is wrong or fictional. Don’t have multiple jobs still open: often people fail to put an end date on their work and it will appear as if you have several jobs on the go; or that you are too lazy to update your profile. Updating your profile is a time consuming and difficult process if you are not used to it. Using our specialized services, however, can make it as simple as getting in touch with us. We offer any additional service you may need, such as adding more information. Every facet of your profile receives a LinkedIn edit. Public profile writing is difficult to do for yourself because it is hard to write about yourself without appearing to be boastful. We can give you a LinkedIn makeover or LinkedIn retool that won’t appear this way at all. The distinctive format and quirky ideas end up in giving you more room to improve personal resume writing skills. You can go through the related resumes written by innumerable professionals for the broad idea. It hardly takes few hours to write an engaging resume through LinkedIn Makeover Service. LinkedIn has become the major source employers turn to when they are looking for skilled employees. What they read about you here says a lot about you. A sloppy profile or one that is not well-written may give others the idea that you don’t really care what the world thinks of you and your skills. By coming to Resume Writing Service for a complete LinkedIn makeover is similar to having a day at the spa with the exception that the good feeling lasts and lasts. Leave your LinkedIn makeover to the professionals. Get this service at Resume Writing Service for an incredibly reasonable rate. Check us out today. 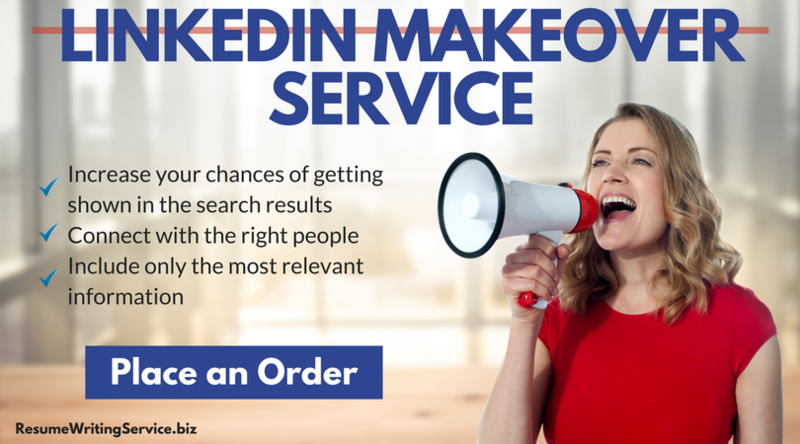 Order LinkedIn Profile service for $129.99 103.99* only now!